Situated on the busy corner of Matakana Village, this small building references a vintage tramcar. It nestles up alongside the macrocarpa clad Matakana Cinemas, which dominates the landscape with its huge domed rooflines. 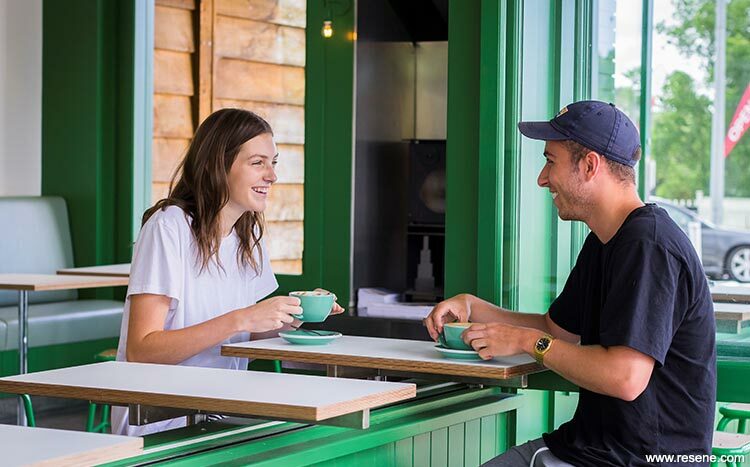 Tuckshop was conceived as a new take on the classic tuckshop, selling sandwiches and burgers alongside coffee and organic icecream. The building was previously home to OOB organic icecream, a summer destination for beach goers. 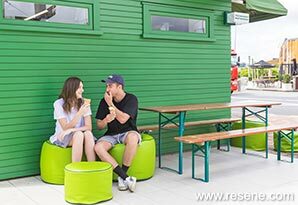 OOB Icecream continues to be a feature of Tuckshop, however the in re-activating this iconic space a strong statement was needed to signal all that was fresh and new. Studio Akin developed a green on green approach that would wrap the entirety of the building and spill from outside to inside, up over one wall, so that the customer experience is to approach the colour, move through it, then from the inside, see the world outside framed by the colour. 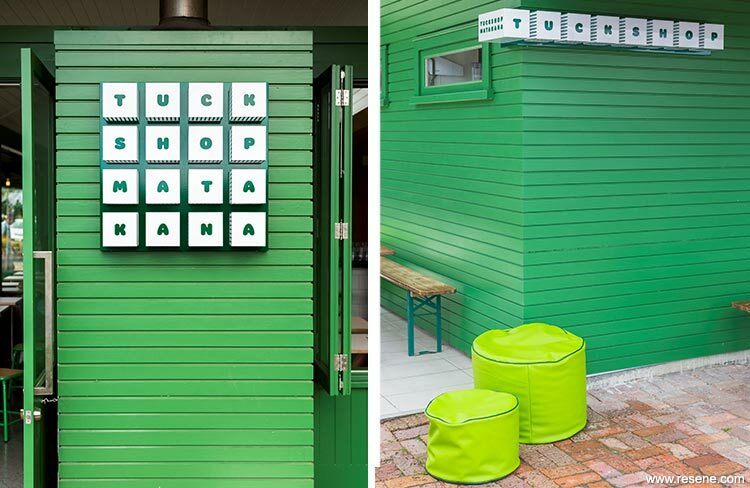 The identity of Tuckshop is fun and friendly - a local hangout and a destination for visitors. Resene Parsley (in Resene SpaceCote Low Sheen on the interior, Resene Lumbersider on the exterior and Resene Lustacryl on joinery) was chosen as it nodded to the initial architectural reference to a vintage tram car, while feeling fresh, fun and contemporary. The green illustrates the fresh concept behind the menu and organic products, complementing the rural landscape.